Abbey Gun Grease LT2 is a long term grease for use on metal slides, gear sets, triggers and sears where extreme pressures exist. Containing Molybdenum disulphide it has a very low coefficient of friction making for a very fast smooth action. Our specification is very stable making a long lasting lubricant that can be used on concealed friction surfaces with confidence. Its high temperature characteristics make it ideal for use in high useage guns. The anti corrosion additives within the Abbey Gun Grease LT2 ensure no rusting or pitting will weaken or reduce the effectiveness of moving parts ensuring smooth fast action at all times. 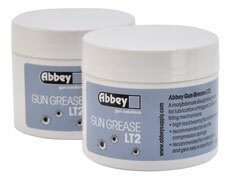 Abbey Gun Grease LT2 is a moly based grease for high load metal to metal friction surfaces. For plastic to metal and plastic to plastic applications with lower load characteristics Abbey Silicone Gun Grease can be used.